In My Mother’s House, the French author Colette has pulled off one of the most difficult tricks in literature: she’s written a compelling memoir without having a compelling story to tell. Colette offers readers no major events in My Mother’s House – no plot, no drama, and very little conflict. Instead, she presents a kaleidoscope of memories about her family, pets, neighbors, and the French village in which they lived. Occasionally, she will relate an important family story. For example, Colette tells how her older sister abandons their family after her marriage and leaves their mother to stand in helpless agony outside of the house in which her estranged daughter has gone into labor with her first child. But for the most part, Colette fills the book with incidental events and small details, such as how her father offered to teach a neighborhood woman the meaning of love for “six pence and a packet of tobacco” and how her mother intentionally distracted the local priest during his sermon “by swing[ing] her watch ostentatiously at the end of its chain”. What makes the book more than a collection of brilliantly realized sketches, however, is its organization around the themes of love and death. My Mother’s House is infused with the knowledge that everything Colette loved from her childhood – her mother, her father, her brother, the beauty of her mother’s garden – have passed away. He did try, and succeeded at the first attempt. He died in his seventy-fourth year, holding the hands of his beloved, and fixing on her weeping eyes a gaze that gradually lost its colour, turned milky blue, and faded like a sky veiled in mist. Colette’s mother follows her husband into death and Colette experiences other losses as well. She tells how the beauty of nature has ceased to move her the way it moved her as a child, and Colette describes how her own daughter, at the age of nine, will soon lose her sense of childhood wonder. 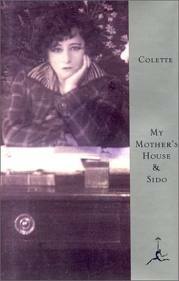 My Mother’s House gains much of its power from the force, clarity, and simplicity of Colette’s writing, which reads like the work of a master of English prose even though its translated from the French. Colette’s book also gains power from the passion that lies beneath her descriptions. Literature can be a furious bulwark against death, in which the writer refuses to accept that all she loves best in life – her mother, her family, the richness of her consciousness – will disappear. In My Mother’s House, Colette has ensured they won’t. They remain vibrantly alive in its pages, which is perhaps the greatest accomplishment any writer can hope to achieve. Notes on the Author. Sidonie Gabrielle Colette, one of France’s most respected writers, was born in Burgundy in 1873 and died in Paris in 1954. She wrote dozens of books, including the novels Cheri and Gigi; was elected to the Academie Goncourt; and was the second woman to become a Grand Officer of the Legion of Honor.